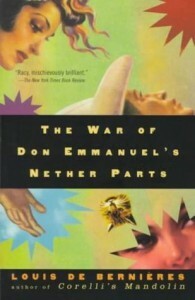 The War of Don Emmanuel’s Nether Parts, Louis de Bernieres, Vintage, 1997, ISBN 978-0375700132, 368pp. In the 80’s, there was a fun independent board game that we would sometimes play called Junta. You played a corrupt power elite family member who gets assigned a stereotypical role (General, guerrilla leader, etc.) in an anonymous banana republic. For all its light-hearted fun of its subject, the underlying assumptions of the game were quite stark if you started to match things up to some of the news of the day. The War of Don Emmanuel’s Nether Parts is similarly troubling. Louis de Bernieres took the real history of several Latin American countries and merged them together to create the unnamed country featured herein. On top of that he also works in stories of the campisinos and peasants, native indians and colonial landowners, left-wing revolutionaries and patriotic army careerists. The characters are almost impossible to keep straight without a game card in front of you, and many over the course of the novel change their affiliation and beliefs. This book truly covers the range of human activity and emotion–the good, the bad and the ugly–but I never felt that it was out of place, especially in comparison with the last “modern” novel that I finished, wherein the author seemed to strain to find something shocking. des Bernieres shocks you sometimes by the simple off-handed nature in which life is so cheaply valued by some of these characters or the ease by which a perceived insult can lead to some real consequences. I must also mention that this novel, while not abstaining from the ultra-realistic (the description of the torture techniques of the secret police being the most disturbing), is also a work of fantasy (but then, “aren’t they all?” to quote Alan Moore). des Bernieres incorporates some of the magic realist tropes to give his novel a bit of the flavor of that tradition, and while I think doing so was mostly unnecessary, it didn’t distract from the pleasures of the rest of the book. This is probably the best book I’ve read in recent years and I highly recommend it. Next: Warm Worlds and Otherwise, James Tiptree, Jr.